(From left) Jessica Sidebottom ’17, Callan Frye ’17, and Di Bei ’18 examine a sample as biology professor Amanda Rumore observes. 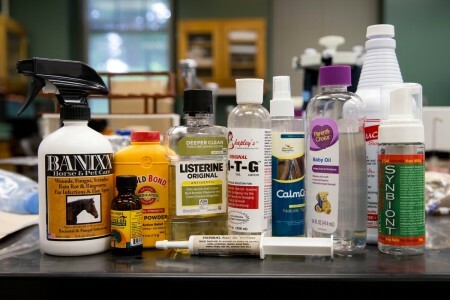 A group of Randolph College students are spending the summer comparing the effectiveness of over-the-counter medications in treating a skin infection commonly found in horses and livestock. 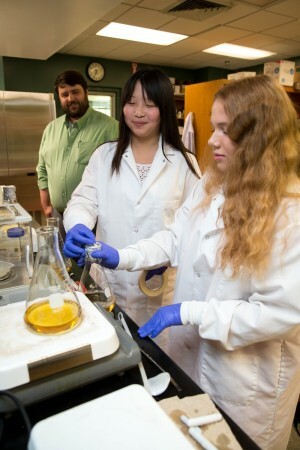 Jessica Sidebottom ’17, Jacquelyn Parman ’18, Di Bei ’18, and Callan Frye ’17 are participating in Randolph College’s Summer Research program and are examining Streptothricosis, commonly known as “rain rot.” The organism that causes rain rot appears and multiplies in warm, damp conditions where high temperature and high humidity are present. Biology professor Adam Houlihan observes as Di Bei ’18 and Jacquelyn Parman ’18 test lab samples. The skin infection is typically treated with antibiotics; however, many owners administer over-the-counter medications or home remedies to their horses and livestock. 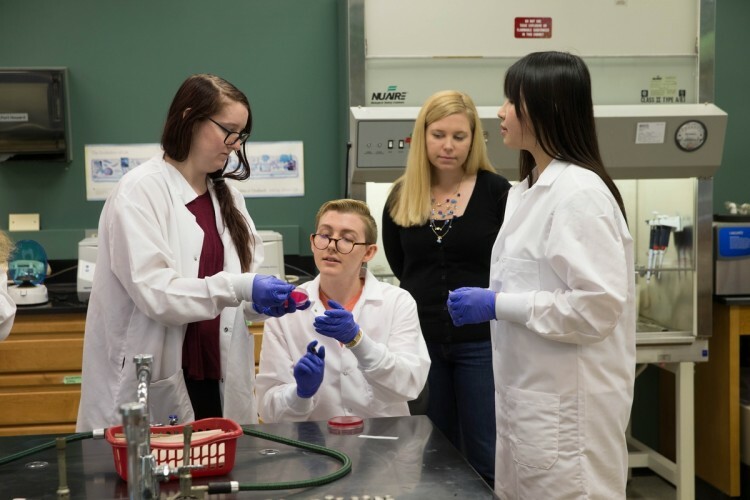 Along with biology professors Amanda Rumore and Adam Houlihan, the students are conducting lab work to compare the effectiveness of some of the most popular over-the-counter medications used to inhibit the growth of the infection. The group has also partnered with Brook Hill Farm, a non-profit horse rescue and therapeutic riding center in Forest, where they are applying the treatments to rescued horses suffering from rain rot. Students are treating each horse with a different over-the counter-medication, and as part of a blind study, one of the farm’s veterinarians is examining each horse before and after treatment to determine which works best. Bei and Sidebottom have enjoyed the hands-on veterinary experience and lab work, and both plan to attend medical school upon graduation from Randolph. “This is going to be really helpful for the horses and for future research,” Bei said. Parman is participating in the project for both experience in medical research and as part of a Virginia Foundation for Independent Colleges (VFIC) and Carilion Summer Undergraduate Research Fellowship. She will present the group’s findings at Carilion Fellow Day at Carilion Clinic in Roanoke. After graduating from Randolph, she plans to earn an MD-Ph.D.
Frye is also completing the project as part of a prestigious VFIC fellowship. He is a recipient of the VFIC’s Summer Research Fellowship, and upon graduation from Randolph plans to earn a Ph.D. in biology lab research.